My little bronies! The Princess Regnant wants YOU! Location: In the magical land of Jersey... Watch your step and don't trip on the cows. United Equestria is at WAR and we need strong capable ponies to join us! The Four Stallions have been unleased, the trenches are filled with the mire and muck that is indicative of a hard and long fight! Heed Our call! 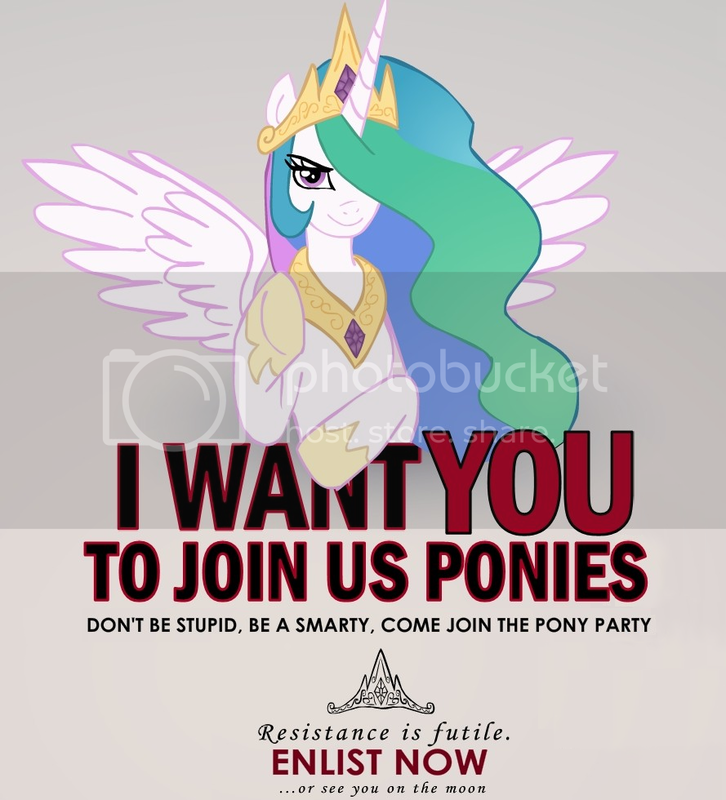 Join the United Equestria alliance NOW! We, Rí Túaithe Caoimhin Ironhooved, give Thou permission to invoke the name of Our nation on Thine applications, The Everfree State. ONCE THOU HAST ENTERED INTO THE WORLD OF PLANET BOB, SET THY ALLIANCE AFFILIATION TO "UNITED EQUESTRIA APPLICANT" AND READ THIS THREAD ON THE OFFICIAL UNITED EQUESTRIA FORUMS: How to Apply for Membership and Masking . WE GET BITS FOR PONIES WHO INVOKE OUR NAME OR NATION ON THINE APPLICATIONS! SO DO NOT FORGET WHO SENT THEE ON THINE WAY TO THE GLORIOUS ALLIANCE OF UNITED EQUESTRIA! MAY THE TWIN GODDESSES PROTECT THEE!